After trying Cinnamon Rooibos I thought it might be a great way to infuse the Rooibos taste and cinnamon in my next batch of homemade applesauce. What I uncovered was that not only Cinnamon Rooibos worked, but I was also able to make a batch using Vanilla Almond Rooibos as well. I purchased a Rooibos sampler and I am having fun trying them all. Maybe Blackberry Rooibos next with some seedless blackberries in the applesauce as well? The flavor is exquisite! Brew 4 cups of Arbor Teas Flavored Rooibos using the entire sample packet. This needs to be strong. Brew for 20 min. Peel, Core and Cut Apples and Pears into 1-2 inch cubes. Combine Rooibos, Pears, and Apples in Stock Pot. Cover and cook on high heat for approx. 15 min. (careful to stir so it will not boil over). Remove lid and continue to stir. Use a potato masher to help break down the apples. If you like a chunkier sauce a potato masher works, if you like a thinner sauce use a hand blender. Continue to cook the mixture down to the consistency you prefer for applesauce. On high heat for a thicker sauce it can take 45 minutes stirring often to prevent burning. 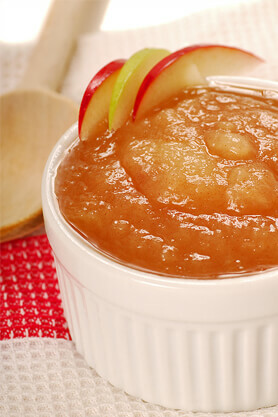 Once applesauce is the consistency you prefer, take a tablespoon full and set aside to cool in order to taste. Then add honey to sweeten to taste. Start in 1/4 cup increments! When using Vanilla Rooibos, I put 2 TBSP of Vanilla and 1/2 Cup of Honey and the applesauce tastes like cream soda! Preserve as you wish - applesauce will freeze, it can also be hot water bath canned. Let cool if you are going to eat right away and enjoy!!! **This also tastes awesome if you place the applesauce in a cookie pie crust, let set over night and then top with whipped cream....YUM!